Melt the butter in a fairly large pot. Add the flour. Using a wire whisk, mix together well. Add the bouillon cube/water mixture slowly and whisk together. Slowly add the half and half. I like to make sure there are no lumps and that it’s very creamy, so I whisk constantly. Heat just to boiling. Then slowly add the milk. 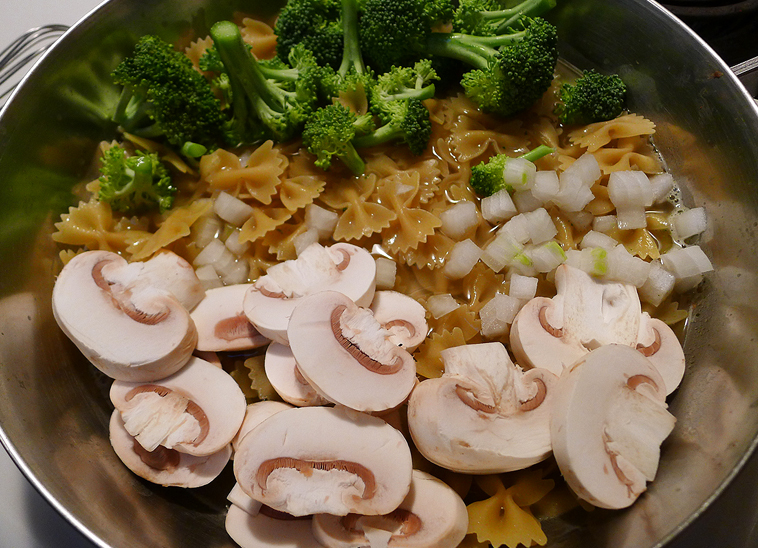 Mix well, add the broccoli, mushrooms and onions (or whatever else you’d like to add!) Heat until just boiling, then turn heat to low, so it is just simmering. 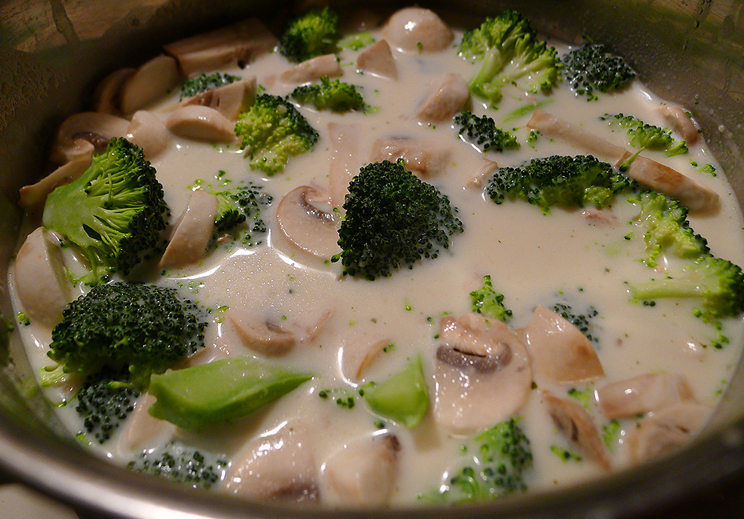 Stir often with a wooden spoon until the broccoli is soft, but not too soft, about 15-20 minutes. Serve immediately, with rolls or crackers. Top with shredded cheese if you’d like. Enjoy! 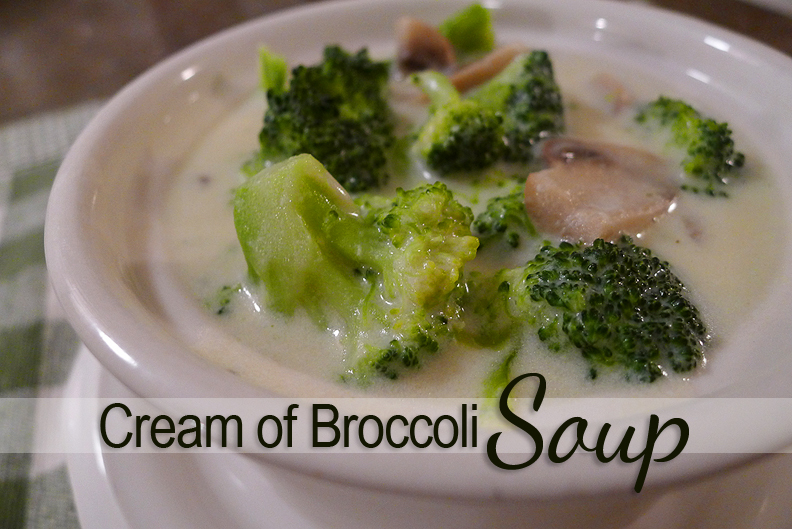 This entry was posted in dinner, recipe, soup and tagged broccoli, creamy, dinner, recipe, soup. 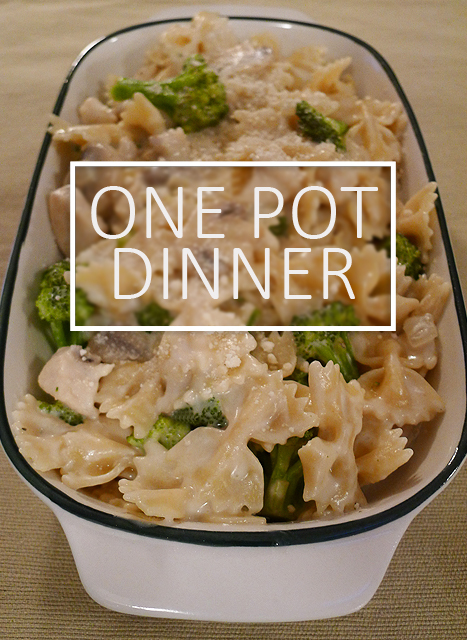 I love a dinner you can cook in one pot. Less clean up is a very good thing! 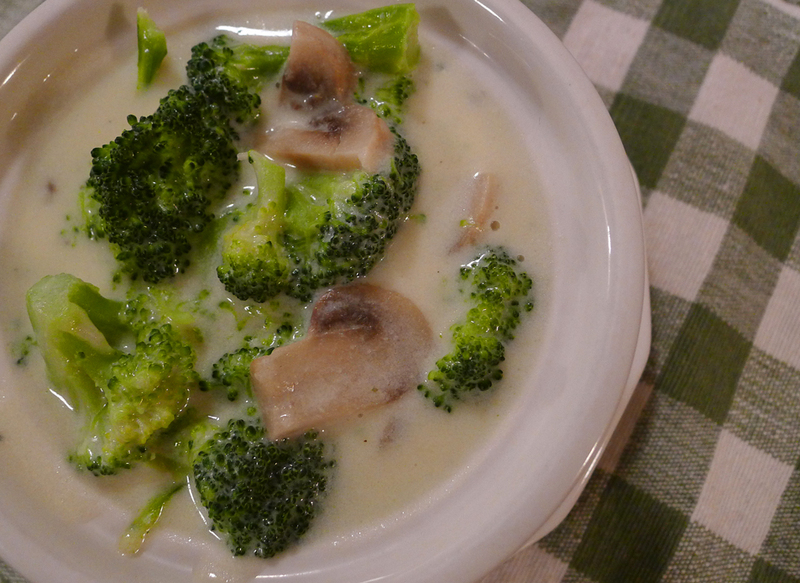 This recipe was inspired by Martha Stewart and my need to use up the mushrooms, broccoli and chicken I had in the fridge. I never thought of cooking a meal like this, and it might very well be life changing for me! The idea of this recipe is to throw everything into the same pot and cook it all at once. I had to use up some chicken that was already cooked, otherwise, I would have thrown in the raw chicken as well. But since it was pre-cooked, I didn’t want to dry it out. So I added it at the end, just to heat it up. Here is the recipe for this fabulous dinner. 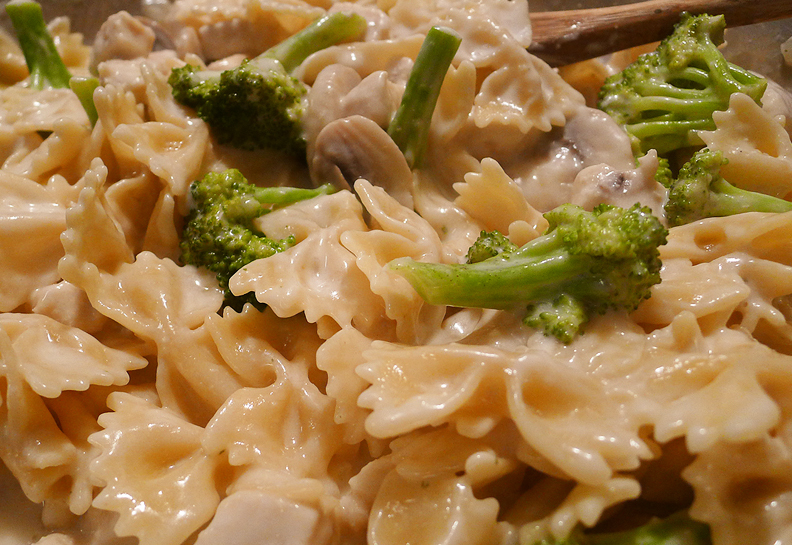 Place the pasta in your pot, along with the chicken, broccoli, onions, and mushrooms. Pour the chicken broth over the top and add the olive oil, lemon juice, salt and pepper. Bring the pot to a boil over high heat. Reduce to medium heat and cook. Stir the pasta frequently with a wooden spoon to break it up and prevent it from sticking to the pan. Cook the pasta for about 9-10 minutes. Most of the liquid will have evaporated. Add the half and half and heat until warm. Remove the pan from the stove and garnish with grated Parmesan cheese before serving. Enjoy! 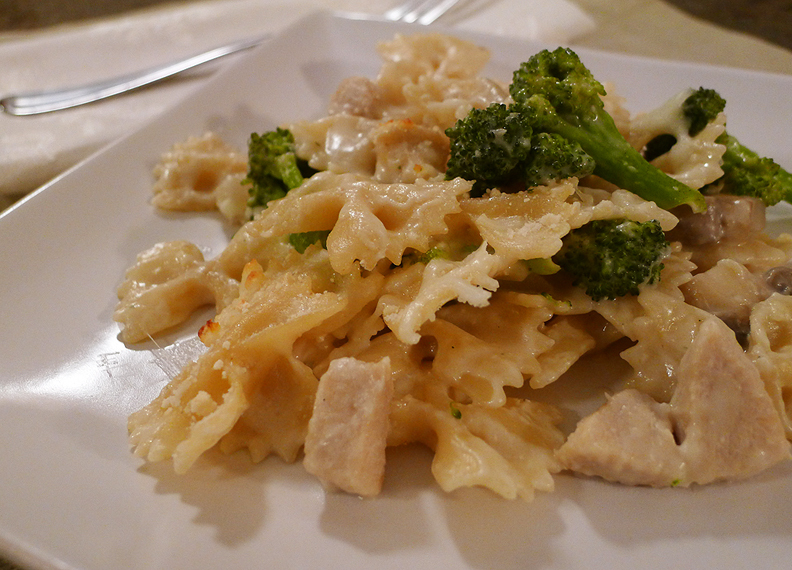 This entry was posted in chicken, dinner, menu plan, recipe and tagged broccoli, chicken, dinner, menu, recipe.